Adam Lamb was employed by the Reverend Thomas Watson, Pastor of Dardenne Presbyterian Church (1844-1888), to teach school in a small stone building on the Watson home place which was located across from the present church and school. His pupils were the Watson children and a few other children from neighboring farms. A learned professor born in 1804 in Scotland, Lamb came to the St. Louis area in the 1850s. He taught in High Hill, Fenton, Potosi, and several private homes in St. Louis. Handed down to posterity are many stories about his intelligence, scholarship, absentmindedness, and eccentricities. He was dearly loved. He died January 18, 1878, and was buried in the Watson family plot in the Dardenne Rock Church Cemetery. 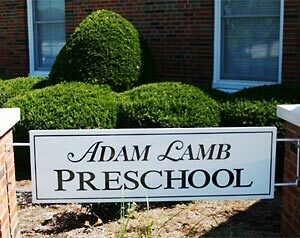 In the tradition of this early interest in the Christian education of Dardenne's children, Adam Lamb Presbyterian Preschool and Academy opened its doors in 1987 as a co-educational preschool serving families in a variety of backgrounds, races, creeds, and cultures. Growth of the school in 1988 included the addition of an afternoon preschool program and the opening of a kindergarten class. In 1992, the name was changed to Adam Lamb Presbyterian Preschool serving children 3 to 5 years of age. The preschool program was expanded at this time, adding one additional three-year-old, and an additional four-year-old class. In September of 2003, the preschool's enrollment was at 206 children. To meet the continuously changing needs of the students, two new programs were introduced. The opening of the Junior Kindergarten program in August 2010 offers a more challenging curriculum for those students who just miss the kindergarten cut-off date or for those who may benefit from a third year of preschool. In January 2012 the Lunch Bunch program was started, allowing students to experience a full day of preschool activities before entering full-day kindergarten. It soon became apparent that the trends in early childhood education were moving more towards full day sessions. This was due to a desire to better prepare children for full-day Kindergarten, and to a need to assist working parents with child care. As a result a full-day prekindergarten class was offered at Adam Lamb Preschool in August 2016. Today the total enrollment at Adam Lamb Preschool is at 170 students. Interestingly enough, it is unknown when the word Presbyterian was dropped from the preschool’s name. We strive to provide an atmosphere in which a child can grow to his/her full potential academically, spiritually, physically, socially and artistically. Need a developmentally appropriate program designed to challenge their abilities. Possess a natural curiosity that should be rewarded with opportunities for exploration and discovery. Are individuals who must learn to value their own uniqueness as they develop a positive self-concept. Should be provided changes to make choices and decisions. As part of the community of the church, the school and surrounding area, recognizes their responsibility to the family of man. Seek creative expression through the media of the arts. Require a physical education program which stresses motor skills and fitness. Flourish in an environment which models and teaches strong moral spiritual values. Need the support and affirmation of a church fellowship in personal relationships.